Let’s assume you’ve already made the decision to go to Africa, and have figured out how you’re going to pay for the trip. Let’s assume you’re in the process of getting the required visas and inoculations. You’re excited about seeing magnificent animals in their natural habitat, but at some point, three basic existential questions occur to you about the safari experience: 1) Where will I sleep? 2) What will I eat? 3) What happens when I need to go to the bathroom? 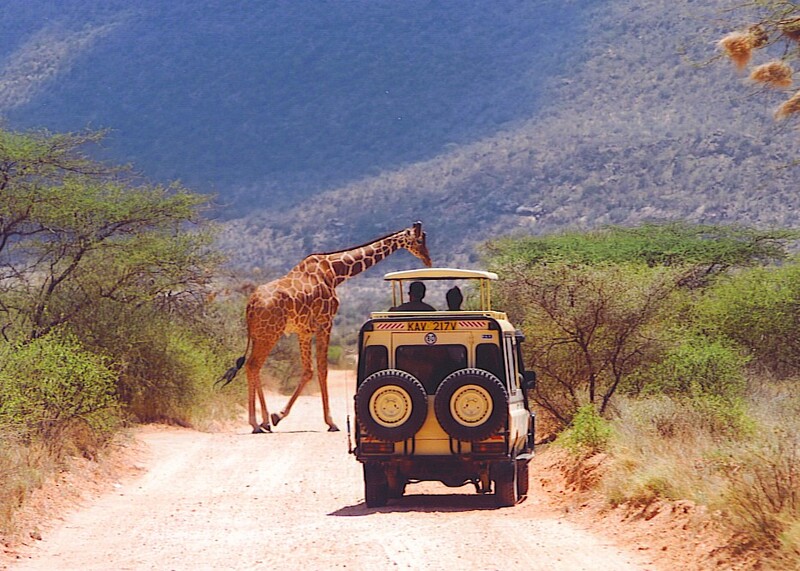 Chances are good that while on safari you will either sleep in a lodge or a tent camp. The lodges are essentially small hotels, and vary from fairly basic to pretty darn nice. The tents are not nearly as primitive as that name suggests. They do have canvas sides and roof, and the front entrance zips, but the interiors are quite nice, with a shower and flush toilet. In most of them you sleep in a king-sized bed, and not on a cot. It’s a good idea to keep your tent zipped up at all times, incidentally — monkeys have been known to go in and trash places that are left unattended. You probably won’t return from Africa raving about the cuisine, but you won’t go hungry, either. There are things to eat that are recognizable as being in the food spectrum. Dining rooms at the lodges and tent camps try to appeal to western tastes, but bear in mind that menus are much more limited than they would be in a city. 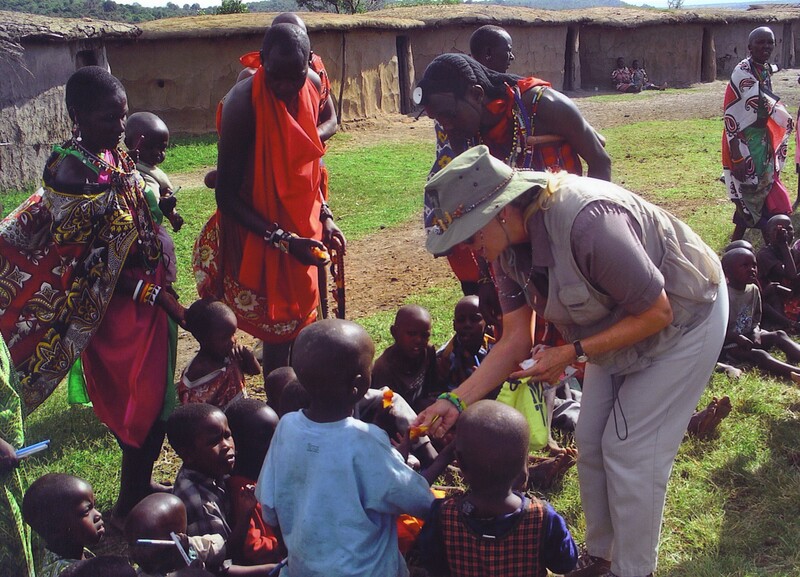 For example, one night in Kenya’s Masai Mara we had three options for dinner: salmon, lamb, or chickpea curry. Since any other restaurant is many, many miles away and the only way to get there is by walking across vast expanses of wilderness, you would become food before you would find food. My advice, if you don’t like the entree selections, is to fill up on bread and hang on until breakfast, which is almost always good. Since the game drives can last for several hours at a time, inevitably you and others in your group will need to use a toilet. Some of the national parks and game reserves have shacks for that purpose, but none are what you’d call immaculate. The restrooms at Olduvai Gorge in Tanzania are among the world’s stinkiest. But, you may wonder, what if the need arises while you’re far from anything that even approximates civilization? Hey, it happens. The driver will stop the vehicle and the passengers take turns going behind the vehicle, and — you know, going. Make a note to keep some toilet tissue and hand sanitizer in your safari vest, as well as a Ziploc bag to dispose of the tissue. But let me get off that topic and emphasize how spectacular the safari experience is. Some days are better than others, of course, but I always found it exhilarating to drive across the savanna in search of beautiful animals. Sometimes the Land Cruiser will be on a dirt track, but sometimes you are in territory where there literally are no roads. The driver scans the horizon and starts off in whatever direction seems promising. 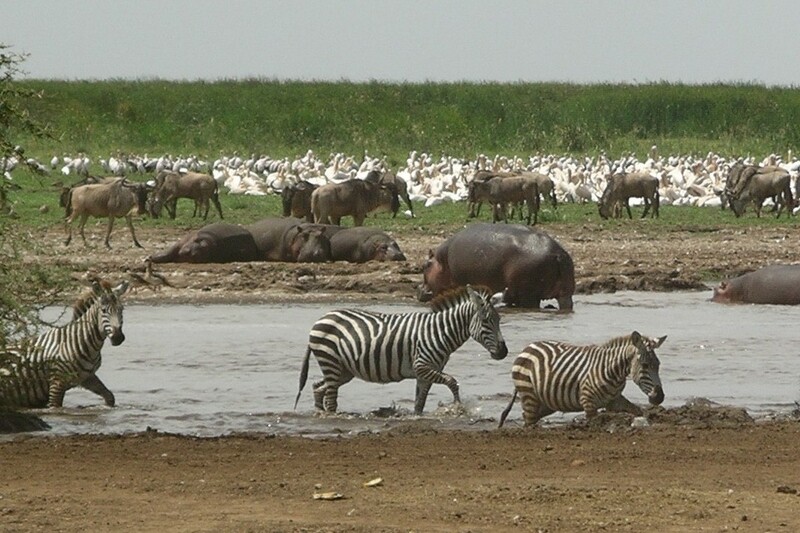 Soon enough you’re seeing various kinds of antelope and zebras… then giraffes… elephants… lions. Yes — they are right there, within a few feet of your vehicle! Oh, and if you’re wondering, the driver keeps the motor running, just in case a quick escape is necessary. He knows that if you get mauled, it could affect how generously you tip at the end of the safari. Mmm, no ants on this acacia branch. We could hear the elephants coming toward us before we could see them: The sound of limbs snapping and trees toppling made it obvious that an elephant deforestation project was underway. Soon they emerged into a clearing, chomping on branches. A study published last month in Current Biology came up with an answer. It turns out that ants are defending the trees from elephants. Yes — ants. It would seem like a mismatch, since your average ant weighs abut 5 milligrams dripping wet, and your average African elephant weighs 250 pounds — at birth — and several tons when fully grown. 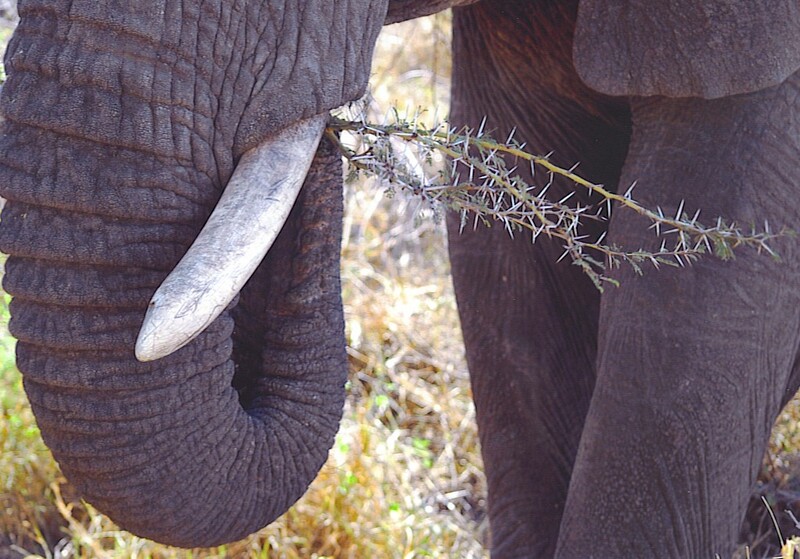 Biologists Todd Palmer of the University of Florida and Jacob Goheen of University of Wyoming conducted a study to investigate the connection between ants and stands of acacia trees that elephants wouldn’t eat. In one experiment, they removed ants from acacia trees to see if there was something in the tree’s chemistry that repulsed the pachyderms. Not at all — the elephants gobbled up those branches. It seems that the ants drive off the elephants by crawling into the elephants’ nostrils and biting them. Elephants don’t like ants up their trunks, just as human beachgoers don’t like sand up their trunks. By the way, ants don’t deter giraffes, because they are able to swipe the ants away with their long tongues. Anyway, this arrangement between acacia trees and ants is what scientists call SYMBIOSIS. You may recall from your high school biology class that symbiosis is cooperation between two species to their mutual benefit. Thanks to the ants scaring away the elephants, the trees get to live. And what do the ants get out of the deal? They get rent-free lodging and food — they eat the sap that the tree excretes. Meanwhile, the elephants go elsewhere to find ant-free trees. Those are typically in areas that have sandy soil; the ants seem to prefer acacia trees that grow in soil that is primarily clay. Making friends, one balloon at a time. The little community on the edge of Kenya’s Masai Mara may have had a name; if it did, we never learned what it was. Our driver Jeremiah had taken us there one afternoon, and the people of that nameless village clearly knew we were coming. We were greeted by the chief, a group of warriors, and some women who had lined up to sing a sort of call-and-response song. The village may have had 125 inhabitants, most of whom seemed to be children. Before we had left the U.S. for Africa, a friend had tipped us off that if you encounter children in one of these rural places, it’s nice to have little gifts for them. We had decided against school supplies, partly because we didn’t know if schools exist in that remote corner of the country. Another consideration was that we couldn’t imagine any kid in any part of the world thinking, “Oh boy, they brought me notebook paper!” So we had gone to a party store and bought a bunch of little toys: finger puppets, spinning tops, and balloons. It hadn’t occurred to us that they had probably never experienced balloons before. In retrospect we slap our foreheads and think, well of course they hadn’t. They didn’t have electricity or running water — why would balloons be a priority for them? Anyway, we seem to have been the outsiders who brought these novelty items to that village in western Kenya for the first time. And then our challenge was to help the Maasai tribe enjoy this historic moment. The chief spoke little English, and Jeremiah spoke Swahili — but basically we were on our own in trying to communicate how to blow up a balloon. Sally inflated one and released it into the air; as it noisily exhausted itself, the children gasped in amazement. We passed out several balloons to children — and warriors — and my dauntless wife managed to convey, without words, how to blow up these colorful little objects. Either she’s a good teacher or they were eager students — probably both. The villagers took to balloons quickly. Meanwhile, the chief was more or less ignoring all the excitement and was giving us a speech, in his halting English, about Maasai tribal customs. We were doing our best to follow the gist of it, but the kids were distracting us. Within minutes, our brightest students could not only blow up their balloons, they had figured out how to make rude noises with them by pinching the neck as the air escapes. The chief”s speech about his cattle and his multiple wives was punctuated by balloon-generated… um, you know, fart sounds. Sally and I should know better than to make eye contact at a time like that, because the look we exchanged made it even more difficult to avoid laughing out loud. Come to think of it, though, maybe the chief was trying not to laugh at these crazy balloon-bearing American tourists who were standing ankle-deep in the byproducts of his cattle. Let’s just say it was a rich cultural exchange, and after all, isn’t that why we travel? We had to check out by 10:00 a.m., so we had about an hour to kill from then until the vans came to take our little group to the airstrip. As we waited in the hotel’s lobby, someone came and reported, with some agitation, that there was a snake in the lounge. I went to investigate, since I had nothing better to do. It proved to be a small snake, about the diameter of a human finger and perhaps 15 inches long. It was in a corner near a door just off the lobby. I informed some employees who were nearby about this unregistered guest, but when I got them to come and see, they didn’t want to have anything to do with it — when the snake would wriggle, the employees would jump back from it. I was amused by their timidity; it seemed to me that they were overreacting to such a small reptile. The other guests were keeping their distance, too — after having been in the midst of lions and hippos and elephants, why is everyone so fearful of a little snake? …That night, on the ride to the airport in Nairobi, I told our guide Lewela the story of the snake at Lake Manyara that morning. He had a different opinion of what kind of snake it was, based on my description of it. He thought it was a dangerous snake, and said that the guy who characterized it as a “brown snake” was making that up, so as not to alarm guests. Lewela guessed that it was, in all likelihood, a young Puff Adder. Who knows? If it was indeed a Puff Adder, the employees were justified in being cautious, because that’s an extremely venomous snake. After we got back to the States, I checked it out on the internet, and I’m pretty sure it wasn’t a Puff Adder. I did learn that there is in fact an African variety of Brown Snake — pictures of which look very much like the one I saw — that is capable of inflicting a serious, though not usually lethal, bite. Whatever it was, it’s probably a good thing I didn’t try to pick it up and remove it from the lounge.